It have contact , Stomach poison with having respiratory action. It is useful against Stem borer, Green Leaf Hopper, Brown Plant Hopper, Gall midge and Grass Hopper in Paddy crop. It is very useful against termites infestation in crops as well as buildings, wood work and furniture etc. 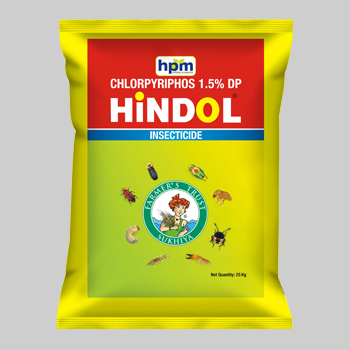 Chlorpyriphos is used around the world to control insects in agricultural, residential and commercial settings.it ischolinesterase inhibitor. Non- systemic insecticide with contact stomach and respiratory action. Crystallinesolid, white to pale yellow. Chlorpyriphos is very toxic to many bird species such as grackles and pigeons, and it is moderately toxic to others such as mallard ducks. Mallard ducks fed Chlorpyriphos laid fewer eggs and raised fewer ducklings. The eggshells were thinner than normal, and many of the young ducklings died. Of all birds, robins are most often found dead following accidents involving Chlorpyriphos use. It is also very toxic to fish and aquatic invertebrates. It may build up in the tissues of fish and other animals that eat smaller animals. This is known as bioaccumulation. It is very toxic to bees. It can poison non-target insects for up to 24 hours after it is sprayed. Can be toxic to earthworms for up to 2 weeks after it is applied to soil.